Here's the promised photo for you of the giveaway prize. ONE of these wool rotary cutter ornaments - the other one is for me! You still have time to comment on yesterday's post to enter. 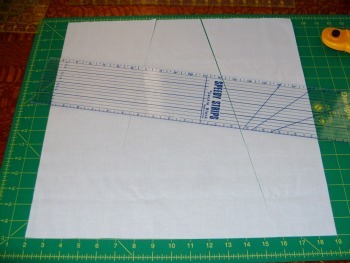 So far it looks like quilters have a 'thing' for specialty rulers. Not surprising I guess as how you cut your fabric is one of the first steps in making a quilt. The ruler in the photo above is called Speedy Strips and copyrighted to Jackie Black. I inherited it from my husband's granny and really love how long it is - 22.5 inches. In this photo I'm using it to cut the angled lines of a liberated churn dash. I keep this one and my Omnigrid 18 inch long ruler on my cutting table above my cutting mat. I'll share more rulers in another post, but wanted to show you what happens for me when I don't have the specialty rulers. . . I design blocks without them! This is my attempt at a dresden with no rulers. The blades are 2.5 inch strips. It's a large block - 18 inches square. This is going to be my next panel quilt - and maybe a tutorial for those who want to play along! But not next week! I'm still binding away on Maeve, my latest panel quilt. 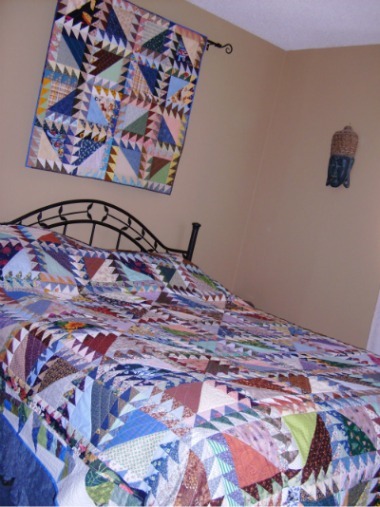 Latest is relative as this quilt is a 12 year long UFO. My plan is to have it finished for the Super Bowl! This is a peek of what she will look like when I finish the binding. 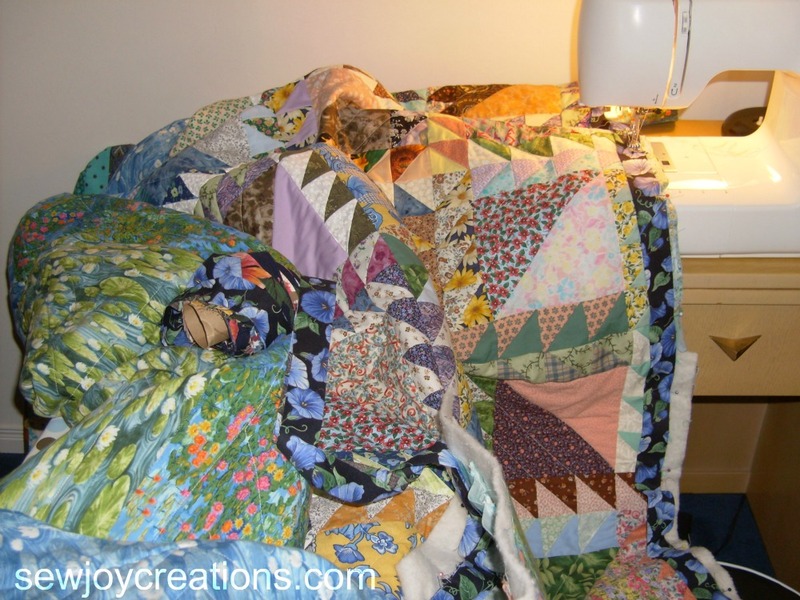 She's a smaller queen than my Liberated Churn Dash quilt which you can see hanging out below. p.s. 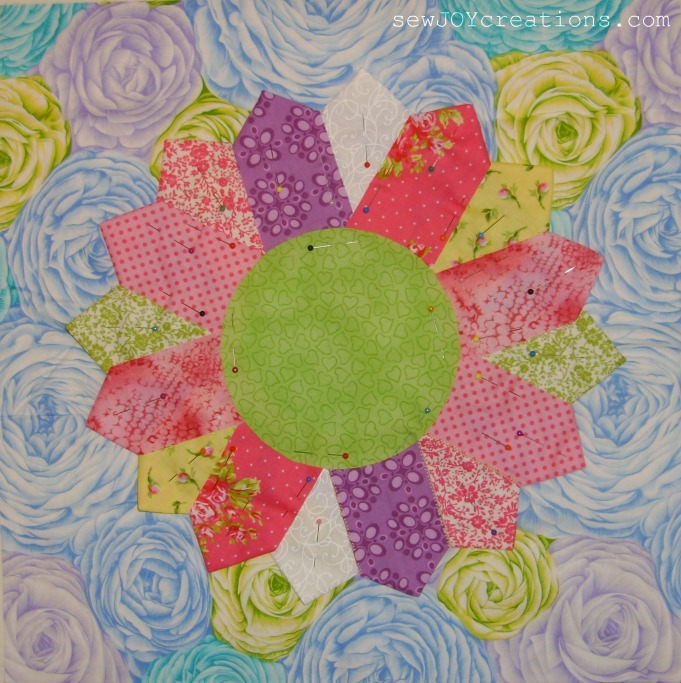 Remember to check out my poll too - where do you find quilting inspiration online?